Music can have a huge impact on the life of a child, not only as an enjoyable activity, but as a stepping stone to intellectual and emotional development. So whether you have a baby, a toddler, or a big kid, Tot Music has a class for you! Descriptions for all of our programs appear below, and we urge you to contact us if you have any questions! Music Together® is an innovative music program developed by the Center for Music in Young Children® specifically for infants through pre-school age children. In our 45 minute class, we provide opportunities for children to experiment with music through songs, movement, chants and instrument play, with the emphasis on the process (and fun!!) of creating music, rather than on performance. In addition, we provide some very special bonding time! Each of the song collections used in class includes a wide variety of musical styles, tonalities and rhythms to provide a rich environment for children and their care-givers to grow musically. Music Together - Babies Class is all the best of our mixed-age Music Together classes, but specially designed for babies! Developing your baby's natural musicality will open the door to a world of possibility, not only for music learning, but for all learning. The early months are so important to this process, which is why Music Together offers a one-semester Babies Class for families with infants from birth through eight months of age. 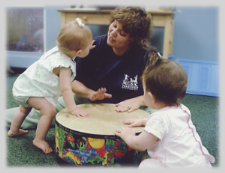 In this class, the activities are specifically designed to teach you how to support music development in infancy and how to connect with your baby through music, using methods such as "purposeful touch," "sound-layering," "dancing for baby," etc. And since our Babies Class uses the same song collections as our other classes, you will experience a seamless transition as your baby grows into our mixed-age classes. Tot Music Drum Program is a drum class for children 4 to 6 years of age with adult (younger siblings welcome). 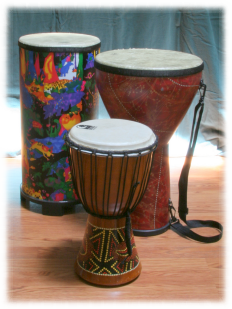 Our 45 minute class will consist of rhythmic play and community drumming, with plenty of opportunity for singing and dancing, too! As with all our programs, music in class will draw from a variety of styles and cultures from around the world. 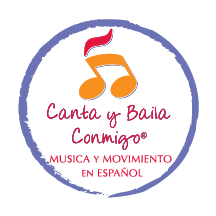 Canta y Baila Conmigo® is a unique program where young children and their adults experience another culture and language firsthand while exploring and developing musically in an age-appropriate manner. The program features: A curriculum with dual, complementary goals of music and language immersion; Informal instruction in a supportive, joyful setting; Beautiful, professionally recorded music collections carefully selected to represent the wide variety of Hispanic musical traditions and genres; An illustrated Spanish-language family songbook including music notation, lyrics and information about the origins of the songs, and English Language Supplement with song translations, vocabulary and grammar points for families learning Spanish. Canta y Baila Conmigo® es un currículo de educación temprana diseñado para fomentar ambos el desarrollo de destrezas musicales y destrezas de lenguaje en español de los niños a través de canciones infantiles y música tradicional de España y Latinoamérica. Es ideal para familias bilingües que buscan un ámbito auténtico donde compartir en español con sus niños así como con otros miembros de la comunidad hispanoparlante. Esta clase se ofrece completamente en español para crear una experiencia de inmersión total. Sin embargo, la clase no está limitada a personas con completa fluidez en español. Estudiantes principiantes e intermedios del idioma que quieran aprender junto con sus niños podrán disfrutar de un ambiente divertido, seguro y acogedor donde envolverse en el idioma y las tradiciones musicales del mundo hispano. Los participantes reciben un cancionero y CD creado especialmente para cada sesión.